Just a quick little post today about the art I used to fill the empty wall over the dresser in my daughter's room. But before we get to the good stuff, I just want to say that when it comes to a posting schedule....well, I don't have one! Subjects for posts come up as I complete projects, and when something appears on the blog it's most likely cos I've just finished it! So please bear with me, and rest assured, I will post, promise! When we moved in here back in October we painted Emilia's room white so that I could change it up really easily just by swapping out soft furnishings or giving the furniture a quick lick of paint, and save myself the trouble of painting the whole room every time I changed my mind or wanted to try something new, which happens approximately, oh, every day! So to that end I painted an old dresser that my mother in law gave to us when we first moved in. It still needs to be varnished to protect it from the dirt-demon that is my daughter but it's pretty, and adds a great pop of colour in the room. 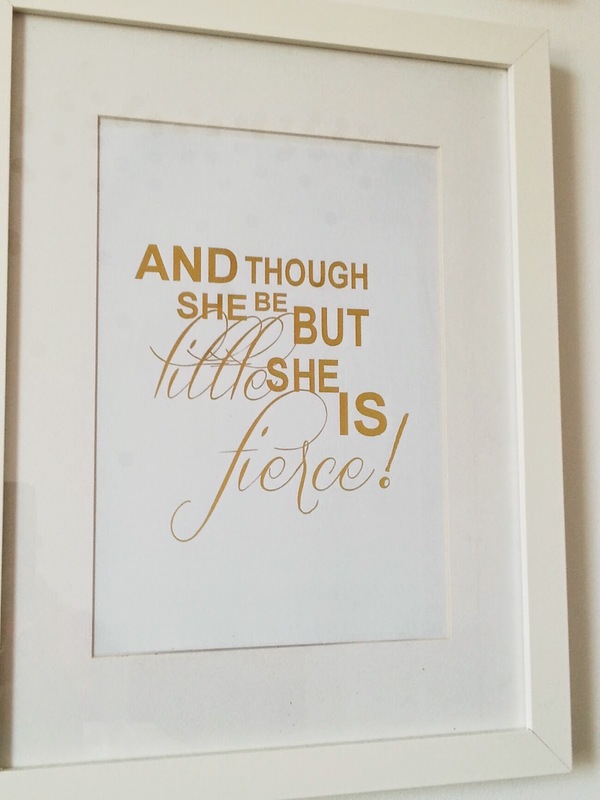 It sits on the wall opposite her bed, and the blank space above it was just crying out for some art, but what to use? There were already animal paintings, family photos and a pinboard on other walls, so I wanted something a bit different. Taking a decent photo of something behind glass is obviously not in my skill set. Alas, I was too lazy to remove it. I had always, always loved this quote from "A midsummer night's dream", and from pretty much the minute Em was born it was clear that it could have been written with her in mind! 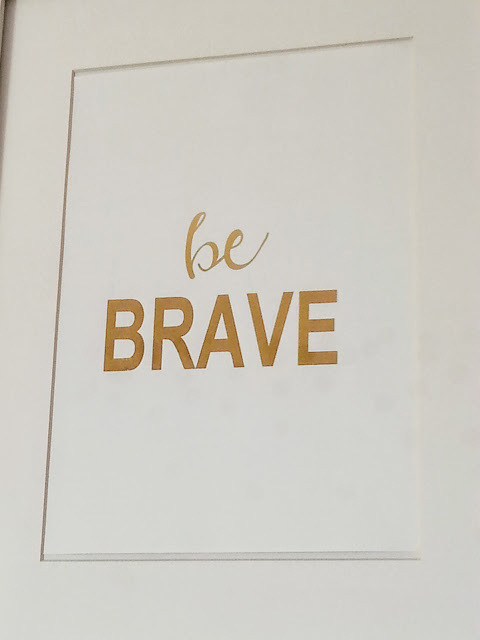 So I ordered me up my Shakespeare quote, and also a "be brave", cos out of all the things I would like her to be, I think brave is a really important one. I also got a second "be brave", and all in the gold foil, 8.5 x 11, portrait style, and the total plus shipping was $33.50. Bargain! 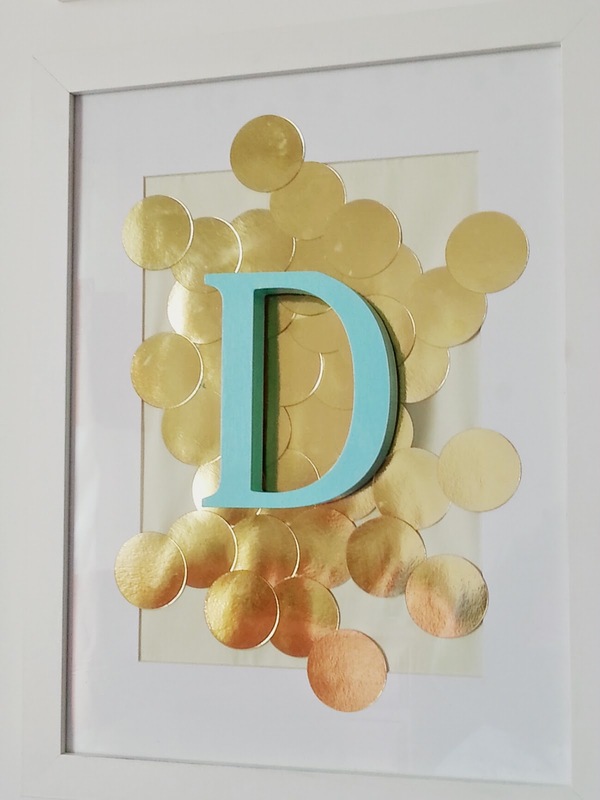 The gold foil is really pretty and catches the light, but I didn't get a good photo of it. I framed them in nice deep frames I got in B&Q. They were on offer, two for €12, so I bought 10 of them! I then had to decide how to hang them, and I thought it would look good to use some of my stash of frames to do four of the exact same size over the dresser. As for what would go in the other two frames, I thought I'd stick with the typographical theme and find a way to use wooden initials I had bought a while back, not knowing what I'd do with them. 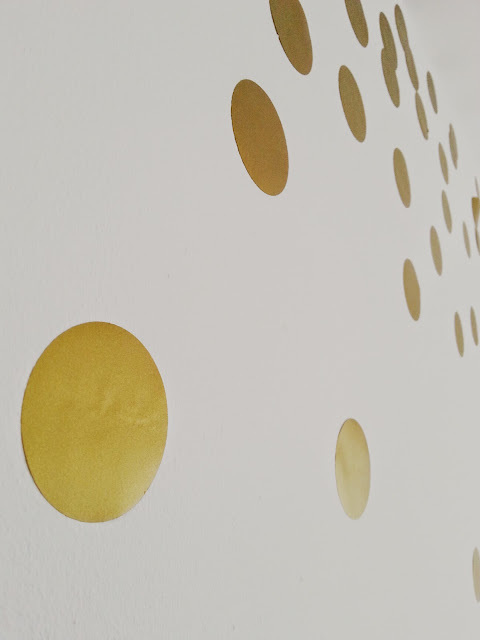 So I painted them in the colours I was using for the room, and then came up with a background of gold dots for them, to mirror the wall opposite. I had these dots left over from Christmas. Ikea were selling them in packets so I bought a few to make garlands from. 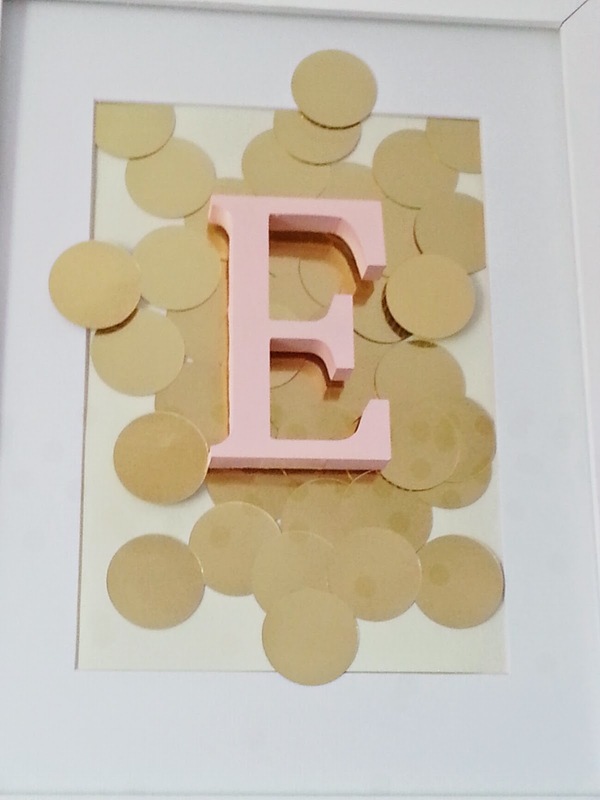 You could get the exact same effect with gold card and a circle paper punch though. See the dirty marks on the dresser?! The shaaaaame!! 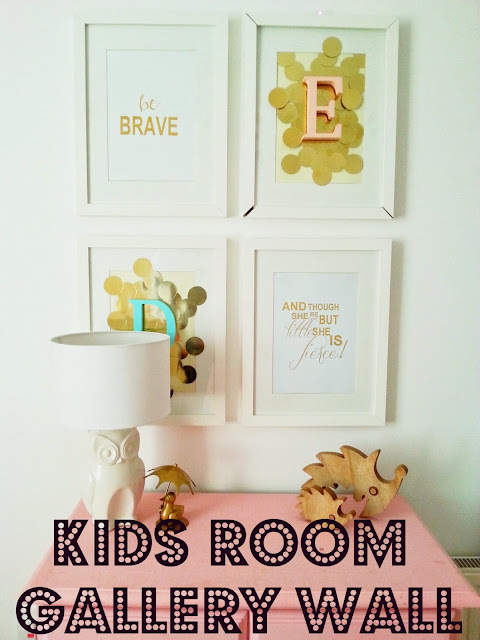 What quote would you use on a kids wall? I'm doing my baby sons room at the moment and I need ideas! p.s: I'm not paid to endorse Designee's shop or anything, I just found her and was genuinely happy with what I got. I love the hedgehogs! Where is that from? I wish you had a button that I could click and it would read your blog posts to me in your voice so I could soak up some Irish accent! I live in the Midwest in America and am accent-less. I visited Ireland once, I loved it. You have Euro stores there that are the equivalent of our Dollar Stores? I'm so charmed! Is the Limerick accent a thick brogue? All the better! I found your blog from a comment on Domestic Imperfection (which is the first diy/house blog I discovered, too) and I now follow your blog. Are you familiar with betterafter.net? That is another one of my favorite blogs, you should submit something to that blog that you've done. It helps build your readership. I don't have a blog myself, but if I did, that is what I'd do. 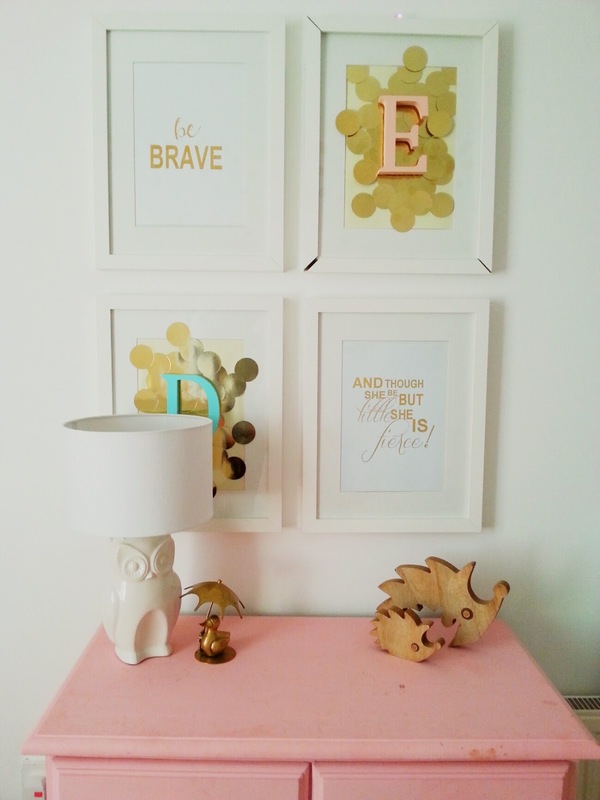 You can also post things in a link party on Miss Mustard Seed's Friday Furniture Feature. These are amazing, I really love the quote for a midsummer night's dream. Don't sweat it about the posting, I post when I can. As I'm out of the house approx 12hrs a day Mon to Fri I aim for once a week but as I say sometimes life gets in the way. I'm with you, I'd rather not post than post about the bunch of flowers on my kitchen table. As for the following, I had 95 posts unread last night! Do you follow many blogs? What do you use? 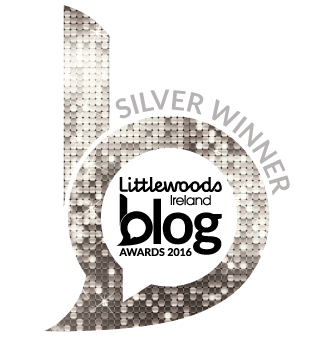 I follow maybe 10 blogs regularly, but to be honest I didn't know about bloglovin etc so I just check in when I get a chance. Having two kids under three really limits my reading time!